No visit to South Florida is complete without taking a trip into the water or out to sea. 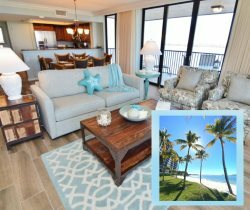 You’ll find there is something for almost everyone close by our Fort Myers vacation rentals. Options for water sports in the Fort Myers-Sanibel area are nearly limitless, from fishing and ocean cruises to swimming with the dolphins and kayaking off the shoreline. This beautiful "Old Florida" style marina is complete with paved parking areas, lush landscaping, marble bathrooms with showers, laundry, Adventures in Paradise cruises/tours, and the exquisite waterfront Lighthouse Restaurant. Plenty of stationary docks with tie-off pilings, a mile long Nature Boardwalk, 2 miles of canoe and kayak trails with rentals available, and the newest, largest Rental Boat Fleet in the area, all await you! Celebrating over 25 years of fun-filled adventures and love for the sea, Adventures in Paradise offers a multitude of water activities, such as fishing, shelling and sunset cruises, sea life excursions, dolphin watches, canoe and kayak eco tours, and private charters! For an adventurous exploration of the Southwest Florida open waters, you can even rent your own boat for the day! Located 1 mile before the Sanibel Causeway Toll, next to Port Sanibel Marina. Explore beautiful and unique islands of Sanibel and Captiva that one can only get to by boat! Cruises include an island luncheon excursion to Cabbage Key and Useppa Island, as well as dolphin and wildlife cruises, sunset serenade cruise, and shelling and beach excursions. Cruises depart daily at McCarthy’s Marina on Captiva Island. YOLO Watersports has everything you`d ever need for a fun time on Captiva Island. Waverunner excursions & rentals, parasailing, flyboarding, scoot coupes, motor scooters, bicycles, beach chairs & umbrellas, stand up paddleboard sales & rentals, Hobie Wave sailboats, surfboards, skimboards, bodyboards, banana boat rides, GoPro camera rentals, Yeti cooler rentals & beach wagons. They are open every day from 9am-5pm. For more information visit their website. Exclusive fishing charters, dolphin cruises and beach excursions are available for you and your family. Fish the inshore areas of Sanibel Island, Red Fish Pass and the surround barrier islands alongside Captain Jack. Be sure to bring your camera to capture pods of dolphins dancing in the boat`s wake! A locally owned and operated company. Three minutes from the Gulf of Mexico, Sanibel Harbour is a doorway to San Carlos Bay, Pine Island Sound and the Gulf of Mexico. It lies across the bay from Sanibel Island. Amenities include valet parking, unlimited boat launching sunrise to sunset, owners lounge and martini bar, gourmet deli and coffee shop, 24 Hour Security, general boat wash down and engine flush after each use, and more! St. Charles is a large, deep water marina located in a beautifully sheltered cove easily accessible from the Gulf of Mexico, Intercoastal Waterway and Caloosahatchee River. There are 65 slips that can accommodate yachts up to 78�. Our full time Harbour Master will assist you with all of your boating needs. We sell diesel and gas and have full pump-out facilities. The marina and club also has 24 hour security.